Umtha designs innovative Africa-inspired jewellery, weaving in the essential characteristics of high quality and affordable pricing. 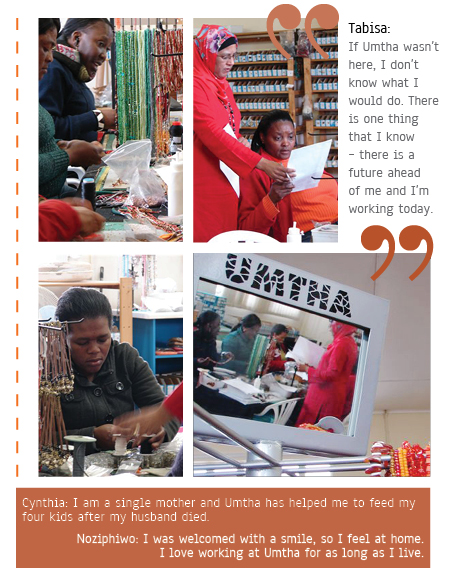 Our excellent team of jewellery producers – previously marginalised women from both Xhosa and French-speaking-refugee communities – are trained to reproduce our designs. After 26 years of trading, Umtha’s position in the South African and international marketplace (mainly tourist destination shops) is well established, allowing our dedicated sales and marketing team to sell our beautiful jewellery far and wide. We’re creative people! We thrive on the buzz of innovation and design. We’re aware of the desperate unemployment situation in Africa and are determined to be part of changing it. We’re passionate about providing fair wage job opportunities for previously disadvantaged South Africans and refugee-status foreigners. We are committed to improving the lifestyles of our team through increasing the potential of the Umtha brand. Umtha stands for fair trade principles. Umtha is a member of the Craft and Design Institute (CDI). Umtha is registered as a Close Corporation (cc) and an import/export company.